In 2009, women who were full-time wage and salary workers had median weekly earnings that were about 80 percent of the earnings of their male counterparts. In 1979, the first year for which comparable earnings data are available, women earned about 62 percent as much as men. After a gradual rise in the 1980s and 1990s, the women's-to-men's earnings ratio peaked at 81 percent in 2005 and 2006. 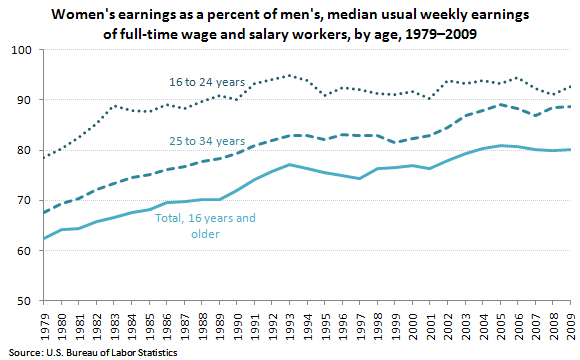 Among younger workers, the earnings differences between women and men were not as great. In 2009, women earned 89 percent as much as men among workers 25 to 34 years old and 93 percent as much among 16- to 24-year-olds. In the age groupings of those 35 years and older, women had earnings that were roughly three-fourths as much as their male counterparts. These data are from the Current Population Survey. To learn more, see Highlights of Women's Earnings in 2009 (PDF), BLS Report 1025, June 2010. Bureau of Labor Statistics, U.S. Department of Labor, The Economics Daily, Women’s-to-men’s earnings ratio by age, 2009 on the Internet at https://www.bls.gov/opub/ted/2010/ted_20100708.htm (visited April 25, 2019).